Footman? What’s that? Why does this wheel seem to have 2 drive bands? We’ve all heard these questions if we’ve been around non-spinners or new spinners at all. If you have ever been to a spin-in, you know that the visitors are really curious about how the wheel works, and when you use a term unfamiliar to them, they want to know more about it. All spinning wheels have a lot of features in common. The wheel itself, a wheel post, a bed, a drive band and the mother of all. To the novice most of these terms are like Greek or Martian. We need to be able to identify the terms and to define them so everyone can understand us. Wheel: It can be as small as nine inches in diameter to about thirty-six inches across. It only matters to the individual how big their wheel is for the ratio of wheel size to whorl size. It can be made with turned spindle work or a solid disc, or have cut outs in the solid disc. It can even be a bicycle wheel or wheelchair wheel. Whorl: This is the other “wheel” or disk that the drive band is connected to. The whorl can be as small as one inch diameter to 6 or 8 inches. The larger the whorl the slower the spin you can put in the fibers. Drive Band: This is made of cotton, linen, or sometimes leather. It connects the wheel and the whorl. Some drive bands are double. They go in the grooves of the wheel and around the whorl and the bobbin. This system gives the tensioning for properly getting the spin into the fibers. Single drive bands go only around the bobbin. Bobbin: It looks like a very large spool. It sits on the spindle in the flyer. It has a starter line tied on firmly. It receives the spun singles. Flyer: This is a large Y shaped piece on the mother-of-all. It has hooks on it for carrying the singles up and down the bobbin, usually. It has an orifice with three holes in it. It also has the spindle for holding the bobbin and the whorl. Sometimes the whorl is a permanent part of the flyer. Orifice: Usually made of metal but sometimes carved wood, it has a hole in the end and either one or two holes in the sides. The fiber goes into the end hole, then out the side across one face of the flyer and is held in place by the hooks. Hooks: These are to guide the singles yarn onto the bobbin. The yarn must be manipulated by hand so it does not pile up in one place on the bobbin. 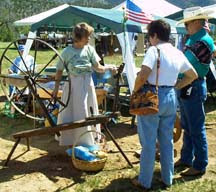 Treadles: Most spinning wheels have either a single treadle or double treadles. It is up to the individual as to whether they want to exercise only one leg or both legs. These drive the wheel by way of the pitman rod(s) and footman. Pitman Rod: Rod that goes up the back of the wheel post connecting the treadle to the wheel. Footman: A flexible piece of leather or nylon to make connecting the treadle to the footman possible. Mother-of-All: The mother-of-all is the whole spinning head. The two Maidens are part of the Mother-of All. the flyer is connected to them. Bed: All of this must rest on some sort of frame. Terminology of each craft is unique and individual. In this case, most of the terminology is from Old English, Old Scots, or Gaelic. To learn a craft is almost to learn a new language. We really do learn a bunch of new terms when we start a new craft. I recommend you find a wood worker to get them made. That is the easiest way to replace the parts. Get back to me if you need more info on these things. I have a great wheel and I know there are parts missing, but i don't know what they are called. Can you help me if take a photo? Yes, It would be most helpful if you can post a photo of your wheel. Several different angles helps to decide what all needs replicated so that it will work. I have woodturners near me that can make most parts we need. Hopefully you do also as it is a bit expensive to ship these things around the country. All we need to do is explain to them what it is we think we want. Sometimes easier than other times, but if we can get the idea across to them it helps a lot. Your article gave us almost all the info we required; however, your definition of "footman" is curious. You state that it is the string that connects the treadle to the pitman rod. Others say that the pitman rod is another name for a footman. Which is the correct description? I took all my definitions from several books I have on spinning wheels. The footman can be string, leather cord, the new texsolve cord, a leather strip or a metal hinge. The pitman is always the rod that pulls the wheel, no matter if it is a spinning wheel or a windmill.